← How physically taxing is SfN? Quite a bit! What is the true cost of attending SfN? This post marks a transition from the thematically focused and daily “official” SfN reporting to a thematically broader and more relaxed posting schedule. As a matter of fact, it has been more than a few days since the last one. This is no coincidence. The reason? Post-SfN recovery. Both in terms of getting back in the game and regaining some semblance of physical and mental equilibrium. I strongly suspect that I am not the only one. As I discussed in the last post, the physical toll of SfN is quite considerable, on the order of running two consecutive marathons. Yet, focusing on the documented physical strain might be a mistake. If anything, it underestimates – and effectively cloaks – the true cost of attending the annual SfN meeting. That cost is best expressed in terms of time – or rather how severely the normal work schedule is disrupted. If someone takes the meeting seriously and also gives a presentation, I suspect this cost to be close to a month. Note that the actual meeting only lasts for 5 days. So how does that figure? Simple: 2 weeks prep (preparing the presentation, making travel arrangements, preparing a schedule), 1 week actual SfN (5 days plus 2 days travel), 1 week+ for recovery. That’s my best estimate. Do I have the data to establish this? No. Do I have the data to support this? I sure do. Consider the figure. The figure represents my total daily sleep duration (as measured by ZEO). 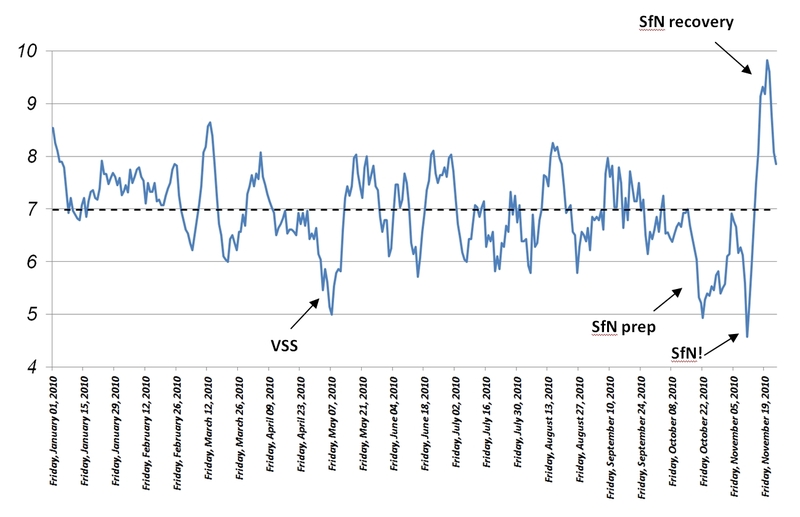 The disruptive signature of major conferences (like SfN) and minor conferences (like VSS) is unmistakable. A month is a considerable time to devote to a conference, representing close to 10% of the work year. As such, attendance becomes hard to justify (it better be worth it). I suspect that others are catching on to this as well. SfN attendance (in terms of yield) is close to an all-time low. This year was no exception. Close to 32,000 people attended. It sounds like a lot, but membership has been skyrocketing whereas meeting attendance has flatlined for years. A crucial test of this notion will come next year, when SfN is in Washington (traditionally, DC yields the highest turnouts). I will be there, of course. Anyone else? Have you been sick in the 10 days after SfN? 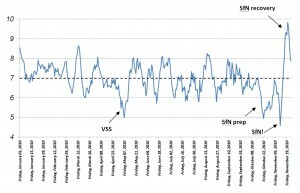 Were you sick in the 10 days before SfN? Of course, I didn’t expect the results to be so dramatic, so naturally, I screwed up with this “toy” poll. A crucial control would be to ask those who didn’t attend SfN. That way, one could distinguish conference induced effects from temporal “cohorting” effects. Drat. This entry was posted in Conference, Data driven lifestyle, Optimization. Bookmark the permalink. 3 Responses to What is the true cost of attending SfN? Wow! Small n so far, but those are pretty dramatic results! I think so. Spread the word. Help to boost the n.